(above) White Moroccan Leather pouffe, $199 from Table Tonic. 1. Country Style magazine's February 2011 issue. 2. 2 of these from Castle and Things. 3. My Ikea Family card (join here). Oooo the new Country Style, I better get a move on, I haven't even finished with January's! Loving your blog! Say what? An IKEA family card!??!?!? I don't know what it is but I'm jealous. Sadly this family card business does not exist in Canada. Yet another reason to move down under! p.s. I spy a WHITE pouffe! Where do you store all these magazines! 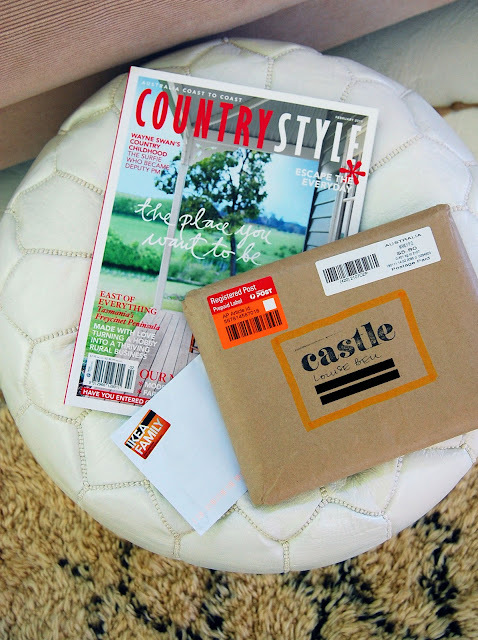 I love for you to do a post on magazine storage! !